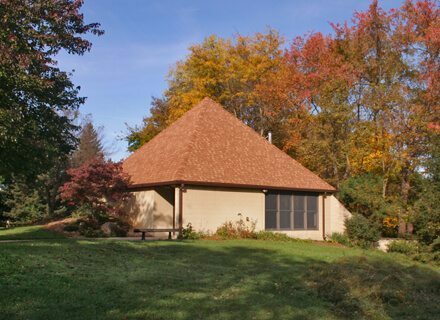 The park’s only enclosed shelter with electricity and modern restroom facilities. Hiking trails, athletic field, playground and volleyball court are nearby and foldable tables and chairs are provided. Two picnic tables and grills located on back deck. A wood burning stove provides warmth during cooler months. Ox Bow Haus is open to the public as a warming house December thru February. From the gatehouse, take the first left and continue for a quarter mile and look for signs for the Athletic field. The shelter will be adjacent to the field next to the parking lot and sledding hills on the right side.